Here’s your quick fix for just about any summer cooking conundrum — make salsa. 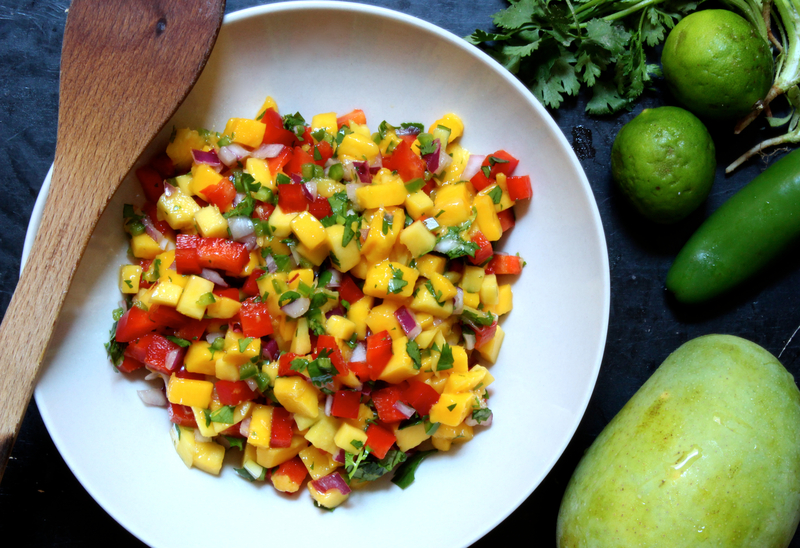 This mango salsa is one of my summertime favorites. I eat it out of halved avocados for light lunch (or a healthy snack) and I pile it on top of juicy pulled pork sandwiches and slow-cooked, carnitas-style tacos. If you’re more of a traditionalist, then just go ahead and scoop it up with tortilla chips — however you decide to use this salsa, I guarantee it will be love at first bite. Meanwhile, dice the mangoes, red bell pepper, and red onion into small, evenly sized pieces. Place them into a bowl. Rinse the cilantro leaves and pat them dry on a paper towel. 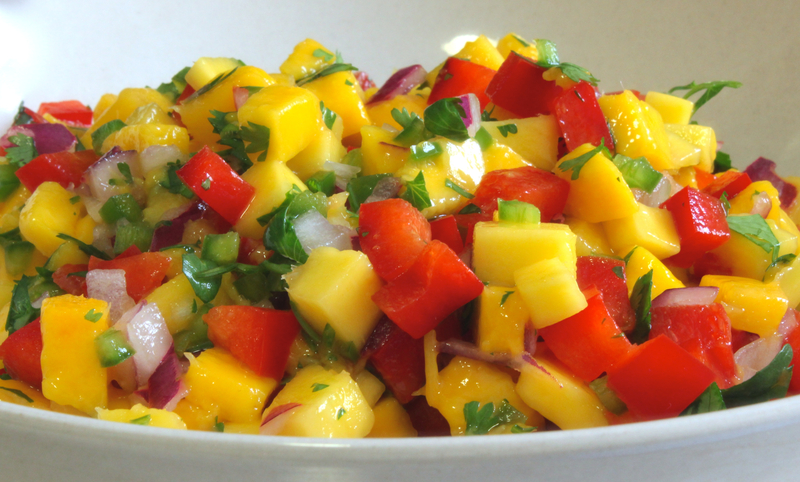 Then, roughly chop them and add them to the bowl with the mango, bell pepper, and onion. By this time, the jalapeños should be cool enough to handle. Peel their skin and scrape out their seeds. Discard the seeds and skin. Then, mince the roasted jalapeños and add them to the bowl of salsa ingredients. Stir all of the ingredients until combined. Then, juice the limes into the bowl of salsa, adding just enough juice to coat the ingredients. Add salt, to taste. A few of my favorite ways to add even more flavor to this salsa? Toss in a pinch of curry powder or chipotle powder. Or, top the salsa with raw, minced jalapeños.